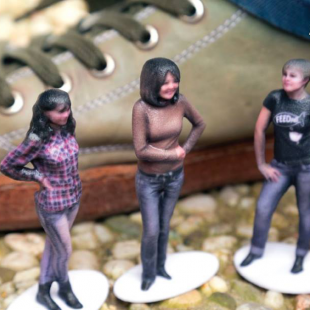 For $59 Shapify will turn you into a 3D-printed plastic figurine. We're going to go ahead and say that the Kinect generally isn't the most beloved console peripheral ever made. Honestly, I'm at a loss for why people dislike the thing so much. Just personally, I like my motion controls that don't work. Regardless of whether or not you like the Kinect, if you own one it's possible that you might want to consider digging it out and dusting it off. I say this because the folks at Shapify can use your Kinect (360 version only) and the ever expanding wonder that is 3D printing, to transform you into a plastic figure that should satisfy your narcissism for at least a month or two. The minis, which are made of "white and multicolored plastic" are 1/20th the size of the person being scanned, with an average of 7-10 cm (2.7-3.9 inches). To make a mini, one merely has to connect their Kinect to a PC equipped with Shapify's custom software. After that, you'll be asked position the Kinect at chest level in a well lit room and then rotate into six different positions maintaining the same pose so it can create a 3D model of you. As long as you're satisfied with the results, you can then order your own mini-you for $59, which includes shipping and handling. All of this said, outside of the aforementioned self-absorption, I'm not sure what purpose these minis could really serve. Granted, I guess they could make an amusing gift for a loved one or. If you're a cosplayer or LARPer you could probably also make a pretty rocking custom mini for a tabletop RPG. Besides that though, there are better things I could imagine spending $59 on. What do you think? Would you want to invest in a Shapify 3D mini?